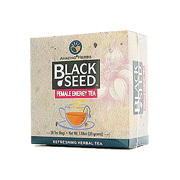 This energizing tea is formulated to help ladies get into an intimate mood. Made with Black Cohosh, Ginseng, Ginkgo, Black (Cumin) Seed, St.Johns Wort, Gotu Kola, and other herbs. A unifque new way to enjoy the nutritional benefits of Black Cumin Seed in the form of refreshing herbal tea. To Enjoy, pour one cup of boiling water over tea bag and steep for 3-6 minutes. If desired, sweeten with honey or stevia. Calories 0 from fat 0, Total fat 0g, Cholesterol 0g, Sodium 0g, Total Carbohydrate 0g, Dietary Fiber 0g, Protein 0g, Iron. Not a significant source of saturated fat, tarans fat, cholesterol, sugars, vitamin A, vitamin C, and calcium. Contains: Black cumin seed powder, Ginseng, Ginkgo, Black cohosh, St. John's Wort, Gotu kola, Green tea, Red raspberry leaf & rose hips. 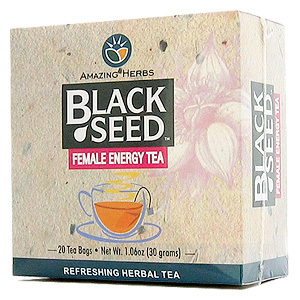 Black Seed Female Energy Tea is shipped in a discrete, unmarked package. Orders are processed immediately and usually take about 3 to 5 working days to be received. We do ask that you try it for 2 to 3 weeks to feel the full effects. Any information received is used only for order processing and shipping purposes. Your information, such as e-mail address, will never be disclosed to a third party.